The Foundry – The Foundry is a renovated industrial space with all the room you could possible want for your big event. It is a 19th century building with more than 3000 square feet of space available to couples and their guests. The outdoor courtyard and greenhouse put you squarely in touch with nature while the views of Manhattan from the rooftop terrace remind you that you are still very much in the heart of the city. Banchet Flowers and the Flower Bar – Beautiful petals to complement any wedding theme adorn the space at Banchet Flowers and the Flower Bar. Whatever your style and your mood, they can be perfectly matched with floral decorations that are exotic, tropical, showy or subdued. Central Park Boathouse – In the heart of the most pulsating city in the world, sits the most idyllic natural setting for the perfect waterfront wedding – the Central Park Boathouse. The original boathouse was built in 1872 with the current structure opening in 1954. The location mixes nature, history and elegance, all connected by the unmistakable energy of the surrounding city. The Lighthouse at Chelsea Piers – A waterfront wedding in a majestic hall where you are surrounded by up to 800 of your closest family and friends – if that sounds like the wedding for you, then The Lighthouse at Chelsea Piers is the place for you. Regardless of the season or time of day, the scenes inside and outside of this 10,000-square foot event space are always picture perfect. Prince George Ballroom – The opulent Prince George Hotel was built in 1904. Its splendid and spacious Prince George Ballroom spent decades as the location of choice for many lavish events. Following a period of decline and subsequent restoration, the Prince George Ballroom is once again available as an event space with many opting for its historic elegance as the perfect backdrop to their nuptials. Marina Del Rey offers ample opportunities for quality New York City Wedding Photography. The venue is located in the Bronx, but its likeness to a Mediterranean seaside villa gives newlyweds and their guests a sense that they are out of the city. In this way Marina Del Rey gives wedding guests the best of both worlds. The location allows guests to feel that they have been transported to an exotic spot, yet still presents them with incredible views of New York City. While the setting of a wedding at Marina Del has its allure, the bride is the focus of this photo. At a break in the celebrations, the bride took time to have her make-up and hair touched up. In the image, she closes her eyes as a friend sprays her hair to hold it in place. 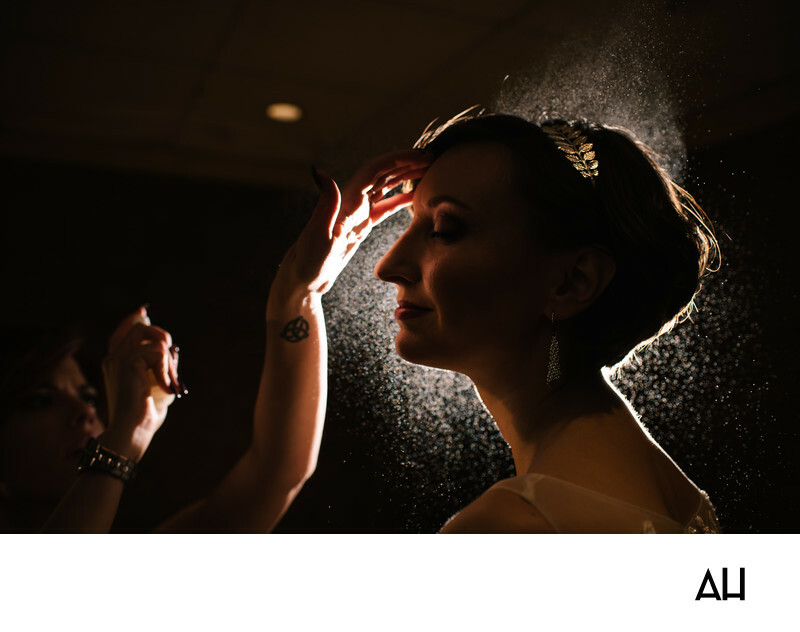 The hairspray and the light illuminating the bride’s face give her an ethereal glow. She looks like a goddess in a mythological tale or the queen of some far away land. The bride is serene in this moment, a content smile on her lips as she is pampered with love. Selecting your wedding photographer needs a careful and planned approach. You are depending on the person you choose to take pictures which capture the essence of your special day. Only a professional can truly get it right, but even then, not every professional photographer will be right for you. Here are some ways to ensure you find your perfect match. 1. Know What You Want – Photography is an art form and every photographer expresses himself in his work. As a result, styles vary and you must begin your search with an idea of the style of wedding photography you are after. Some popular New York City Wedding Photography styles are portraiture, documentary, edgy and fine art. 2. Get References – Past clients are an excellent source of information on what to expect from a photographer, so starting working your way through review sites. Make a note of photographers who are favorably mentioned and whose work you would like to see more of. 3. Shortlist Your Options – The best way to do this is to visit their websites. Here you will get a pretty good idea of whether their style matches yours and you will begin to see what each photographer is capable of producing. 4. Meet the Photographers – Once you have whittled down your list (to perhaps 3, but no more than 5), set up an in-person interview with each photographer. This may be a bit time consuming, but it is the only way you can proceed to the next step. Go to each interview armed with as much information about your wedding plans as you can gather at that point. 5. Delve Deeper – So far, you would only have seen an image or two from different weddings posted on the photographer’s website – you need more. For each photographer on your shortlist, ask to see a full album of their work. That will help you to decide on the consistency of their images. A handful of good shots lost within a multitude of mediocre ones, just won’t do. What are the fees for their standard packages and for the amount of time you will need them to be available for? Who owns the rights to pictures of your wedding? How long is their turnaround time – from wedding day to package delivery? What retouching options do they offer? Exactly how many pictures am you paying for? 7. Make a Selection – After all the interviews are complete, start working your list down to the right one. Now, go over all the information you have on that photographer one more time to be sure you have the perfect fit. If you are sure you do, book the date!